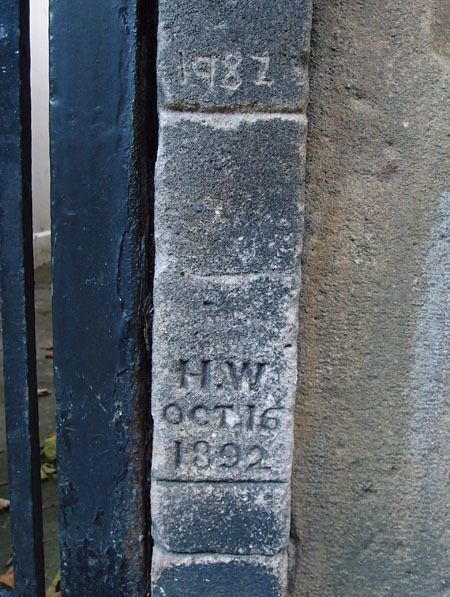 As the Ouse is rising again, it’s a good time to mention this local detail, noticed recently on the gatepost of one of the houses next to Lendal Tower, where the lane descends from Museum Street to the river, alongside Lendal Bridge. Another detail I’ve walked past hundreds of times and not noticed. 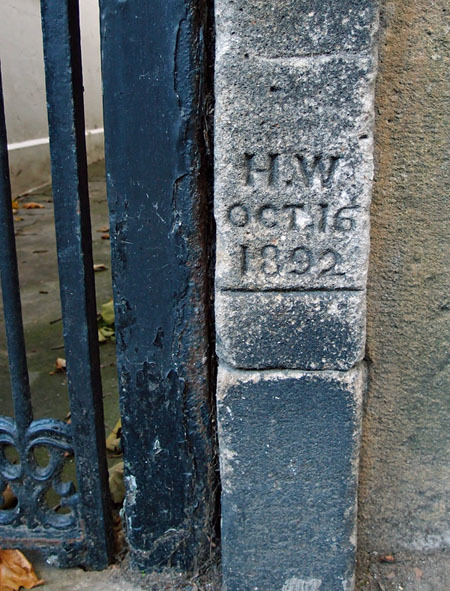 Carved into the stone: ‘H.W Oct. 16 1892′ with a line underneath. If I was passing by, a visitor to the city, I might think that someone called Hugh Williams or Hugo Watkins had just fancied inscribing his name in a gatepost. But if we have local knowledge and awareness of our city’s history the meaning of this is immediately obvious. It’s a marker of the ‘great flood’ of 1892. ‘H.W’ must be ‘high water’. More roughly inscribed, in a more amateurish fashion, with only ‘1982’, but if we get the inscription below we understand this one too. It’s recording another ‘great flood’, 90 years later. The one where the buses couldn’t get through Rougier Street and the private road near West Offices was temporarily opened to traffic. There are stories behind both these inscriptions, no doubt. But I don’t know them. 1982 is recent enough, so if anyone reading does know more, please add a comment. There were other major ‘flood events’ between 1892 and 1982, not added to the post. Was it perhaps the similarity in the numbers, the same digits in a different order, that made someone want to carve a record of the flood on the gatepost? Googling led me to a page mentioning the ‘Lendal Bridge gauge’. In 1892 I’m not sure how sophisticated it would have been. Is this gatepost the ‘Lendal Bridge gauge’? Or perhaps they measured it from the watermark left on Lendal Tower a little further down. Or perhaps (likely) I’m doing them a disservice, and actually they had a sophisticated way of measuring. Last autumn I remember watching from Lendal Bridge, above these houses, as the residents carried their valuables from the property, as the river did the thing it has always done, from time to time, expanding beyond where we’d like it to be. No one carved the 2012 level on the post. We have technology now to record these things. But not quite the same, is it. So many changes since 1892, but this could be us, last autumn. 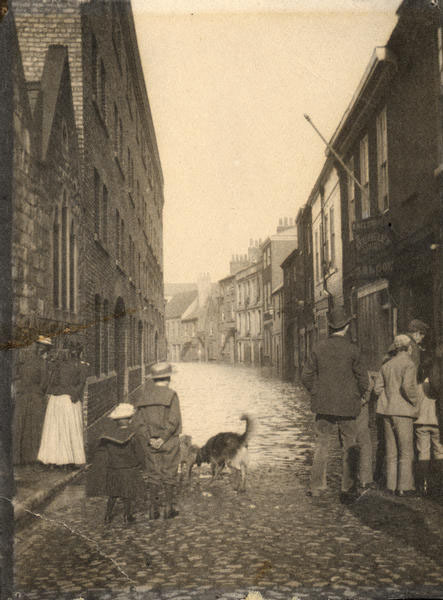 Not on North Street – now defended from floods – but on Skeldergate, a little further along. We all gathered at the edge of the water, watching. The river has risen again today. It’s been a while since the last ‘flooding event’, but I noticed last night, walking by the river, that those waters from the higher ground had reached us, that we had a bigger and wider river than usual. Flood warnings were issued today. Let’s hope that all that extra river passes through without causing too many problems this time. Indeed! Also I’m wondering if the 1982 one is a serious and official mark, or witty graffiti. It could of course have been added at any point since. Measuring the distance between the two markers to see if it matches recorded data might cast light on that. I’m not volunteering, but if someone else fancies popping down there with a tape measure, please report back!